Fans of James Bond will have a licence to thrill at Leeds Industrial Museum at Armley Mills this week as a unique piece of 007 memorabilia goes on public display as part of the Yorkshire Wool Week celebrations. 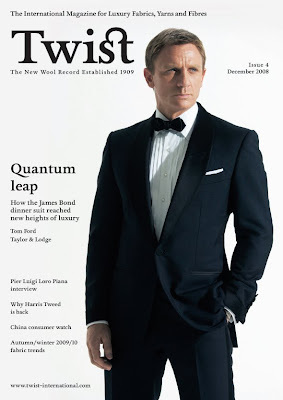 Ahead of the world’s most famous superspy reappearing on big screens in ‘Skyfall’ at the end of the month, a replica of the suit worn by Daniel Craig in the last Bond film ‘Quantum of Solace’ will be one of the must-see items on show as Armley Mills celebrates Wool Week from October 15-22. The suit, created by star designer Tom Ford will be returning to its Yorkshire roots for the exhibition, as it was made with cloth produced by Taylor & Lodge of Huddersfield. Other items on display will include the coat worn by television detective Miss Marple and a coffin made from wool by Hainsworth of Leeds as Yorkshire plays it part in the national celebration in the museum which was once the world’s largest woollen mill. Aside from the exhibition, Yorkshire Wool Week will also offer free masterclasses in teaching age-old knitting and crochet techniques, as well as talks and workshops from some of the world’s biggest names in knitting including designers Debbie Bliss, Martin Storey and Amy Singer from Knitty.com. The sessions are suitable for people of all ages and ability levels, with volunteers on hand to teach the basics of knitting and crochet to anyone keen to start. There will be a look back at some of the classic novelty sweaters from the 1980s which inspired a trend, and a vision of the future too as a selection of garments designed by graduate fashion students from Huddersfield University will be displayed. The inspiration for Leeds Fashion Works emerged from Leeds status as a high fashion retail destination together with the deep heritage in the Yorkshire textile industry. Today one in three of the UK’s textile weaving jobs are based in the Leeds City Region along with 60% of the UK’s textile and fibre preparation and spinning. Leeds Fashion Works aims to bring together educational institutions, skills training and the undisputed interest that young people have in the world of fashion to promote the Leeds City region as a centre of excellence and innovation, and highlight Yorkshire Textiles. For further information on the Leeds Industrial Museum at Armley Mills, visit the website at www.leeds.gov.uk/museumsandgalleries/Pages/armleymills.aspx or call 0113 263 7861.